You know, where "très" is pronounced "trez" and the "t" in "gourmet" isn't silent. "Kake" with a "K", "krab" with a "k", all those things that definitely aren't up to my usual standards for food. This is what my parents and my cousin sent to me the other day. We come from a long line of candy-loving, big-boned/fat people. No matter how many times per week I go to the gym, or how few calories I eat, I gain weight just by thinking about food. But that's another story for another time. This story is about the crap I got in the mail the other day. It's good crap. "Krap", even. To really see the pile in all its glory, check out the notes in the image at Flickr. Basically, I got a box with all the fine food available for export from the commonwealth of Pennsylvania to the lovely state of California. 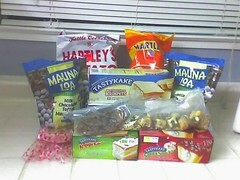 - Various Tastykakes, which I can only get here if I drive a few hours, and I'm not doing that for Krimpets. Well, maybe one day I will, if I'm desperate. - shortbread, not from Pennsylvania, but from my buddy's mom who is an actual Scot and thus knows how to make some shortbread!